Inaugurations, in SLPPNA are not constitutional events, but are always looked forward to as the first point of any new Regional Executive fundraising event in the Region. Fundraising is the main agenda of any incoming executive; as one of the aims and objectives of the SLPPNA is to raise funds, stipulated in the regional constitution and part of all current and past executive manifestos. The Mohamed Bah administration came to power in October 2018, in New York, where an annual convention was held, under the watchful eyes of the National Secretary General (NSG), Mr. Napoleon Koroma, Esq, the National Publicity Secretary, Mr. Lawrence Leema, the Deputy National Women’s Leader, Madam Fatmatta Bockarie and Ambassador Saffa Wuya Rogers (China). The election was conducted by the Regional Electoral Commissioners: Mr. Victor Tarmoh, (Chief Electoral Commissioner), Madam Julia Hawa Conteh, Madam Doris Bangura-Bright, Mr. Edward Nyalley and Mr. Joseph Musa, with a house full of delegates led by the Party Conference Chairman, Dr. Stephen Mannah. Texas, Houston, USA, under the leadership of Madam Alice Ngobeh, will be host to the Region as part of the fundraising agenda for the SLPPNA, on April 13th, 2019 at Dee’s Royal Palace Banquet and Event Center, 11939 Bissonnet Road, Houston, Texas 77099, between the hours of 8pm and 4am Houston Time. 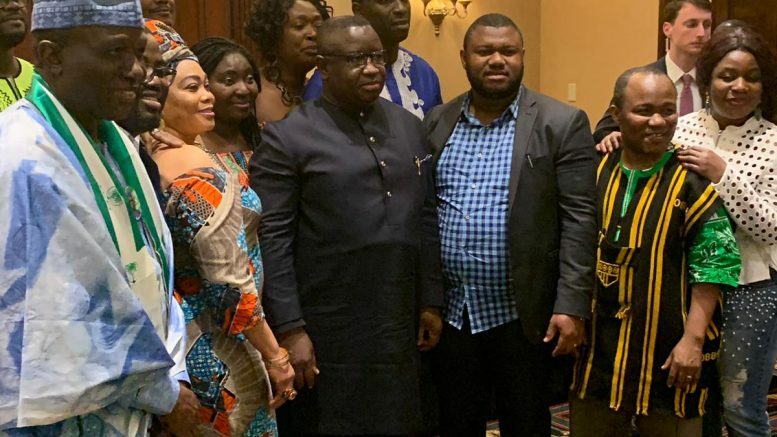 The SLPPNA Houston Texas Chapter Chairmen had included Mr. Tonny Sannoh, the late Mr. Stephen Koroma, Mr. Brima Amadu and Mr. Ibrahim Sheriff. Houston, Texas had hosted the Region in 2015, where the SLPPNA Regional constitution was ratified. Distinguished partisans from the SLPP Party Hierarchy and government officials are expected to attend the inauguration in pageantry and pomp, having tête-à-tête, with members of the SLPPNA, families and friends. And of course tantalizing music and palatable foods and drinks. So, to Houston we must go! But remember to have your pockets full of Dollars. Be the first to comment on "SLPPNA Regional Executive Inauguration: To Houston, Texas We Must Go!"